tries to unpack a Rashomon-esque storyline, involving murder and competing father/son testimonies. “There are eight million stories in the naked city” and every one of them is worth listening to. 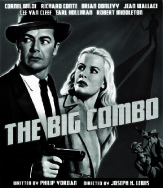 The Big Combo (1955), Olive Films, 87 mins, 2013, $19.95 • Seamy, atmospheric and painted with light by DP John Alton, this moody noir masterpiece focuses on Leonard Diamond (Cornell Wilde), a tough, honest cop who wants to bring down a Napeolonic kingpin, Mr. Brown (Richard Conte). The wrinkle: Diamond’s in love with Brown’s girl: Susan Lowell (Jean Wallace). As the narrative spins around these double-obsessions, we sink into a demimonde of unsavory lowlifes, mayhem, and seediness. Director Joseph H. Lewis and Alton render up classic noir moments: Lowell, seen and unseen, is chased along the bowels of a boxing ring, slipping in and out of shadows as she tries to outrun Brown’s muscle (Fante and Mingo) and herself; a hearing-impaired gangster is executed by two hit men, and as the machine guns blast, we hear nothing, seeing and feeling McClure’s final exit from his poetic perspective of slo-mo shimmers; and in the last scene, dark backlighting silhouettes Lowell and Diamond, creating an offbeat and arresting romantic halo. The Best Years of Our Lives (1946), Warner Bros., 2012, 170 mins, $14.97 • An intensely bright film bristling with feeling, this unabashed work of social realism looks at the adjustment troubles of three returning vets: Dana Andrews (Fred Derry) who comes home to a failing marriage and lack of career advancement; Harold Russell (Homer Parrish), a bi-lateral amputee, who feels vulnerable and unsure of his sexual future with his former high-school sweetheart; and Fredric March (Al Stephenson) who struggles with alcoholism and his role at the bank, providing small-loan opportunities for other returning vets. Each man is healed and partially re-integrated into society through the redemptive love of a good woman: Myrna Loy (Millie Stephenson), Cathy O’Donnell (Wilma Cameron) and Teresa Wright (Peggy Stephenson). Most iconic image: Derry, working through some hauting memories, sits in an about-to-be-junked B-17. The props are knocked off the engines, suggesting an emasculation relfecting his inner life. Director William Wyler and DP Gregg Toland, shoot the film through a series of long takes and deep focus photography capturing a series of truly lived moments. Powerful Americana.